Small Batch | Woxford Brewing Co. I just had a pint of Lone Pint’s Yellow Rose and well, I can’t think of a better beer to start trying to dial in on our Small Batch Sunday series here. The last small batch was Stone IPA which is currently tasting really nice in the dry-hop keg. I’m bottling the Stone this afternoon and tonight will start into another just amazing IPA that is as simple as they come. Yellow Rose is now available all-year around and most recently to me, it can be had in bottles. Hopefully I’ll be able to track down a six pack, or a bomber so I can do a side-by-side. I don’t think this beer can really be cloned right now simply because it varies somewhat out of the brewery. I’ve seen numerous mentions of getting radically different noses and flavor profiles from batch to batch. The silver lining is that everyone agrees that it remains an amazing IPA. My initial impression of this beer’s smooth malt profile that just carries the hops was one that needed a really solid base that’s interesting. My go-to base malt for that sort of thing is always Thomas Fawcett Marris Otter, aka. The Crutch as my good friend once told me of a remark from a pro-brewer here in Texas. It’s hard to go wrong when putting Marris Otter in a beer at any level. Some of my best SMaSH (Single-Malt and Single Hop) beers were 100% Marris. What I’ve seen discussed around the net though was that Yellow Rose uses Wyermann Pilsen malt. I can believe that since it doesn’t seem to have any crystal in it (neither in color nor taste) and lets the hop shine. And it’s certainly easy enough to try a different base malt out next time. 3 gallons of Stone IPA wort boils, one hop addition in. My first small batch has been quite a success so far. 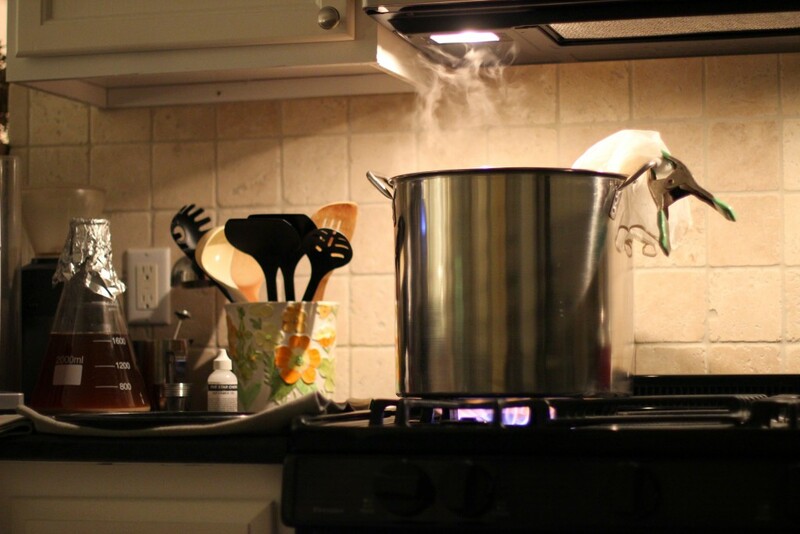 While the whole process wasn’t any shorter, what with all-grain brewing mash, mash-out, boil, chill and pitch. However, the clean up was short and the impact of the brew isn’t 5 or 6 gallons that need to be drunk. Rather, I’ll have 6 750mL bottles to taste, share and critique. If they go well, then it’s an easy scale up to larger batches. In addition testing out various recipes and temperatures with the Jester King wild culture I really like a really good IPA. I’ve backed away from the double/imperial IPA, mostly because I prefer to get the balance of the beer right without just cranking up the ABV. Most commercial examples don’t get it right and have a huge malt-bomb with hop bitterness just scattered everywhere. Don’t get me wrong, there are some great examples. That said, drinkability is a big thing for me now. I’ve a few criteria that I need to have. Dry finish. I just can’t work through that much gravity or lingering crystal malts, no matter how bitter the beer. A massive chewy and sugary IPA just isn’t good. The best chewy IPA you can find is Lagunitas. They mash high, but somehow get the attentuation, bitterness and hops (oh those hop aromas) just right. Massive hop nose. I don’t want to have to hunt for the hops. Either you know what you’re doing with late additions, whirlpooling and packaging, or you don’t and I won’t be able to smell the hops in your beer. Creative hop bitterness. I’ve made a few hop-bombs of my own that were just over-the-top with bitterness and frankly, they’re not that fun to drink. After aging another month, the bitterness is drinkable, but I’ve lost valuable hop aroma while waiting for things to rebalance. Color. I really want a straw to pale color and it should be reasonably clear. I don’t really enjoy a really murky IPA. Not because it doesn’t taste good or smell great, but because I know it can be achieved without sacrificing clarity. A beer that’s been getting this right since forever is Stone IPA. I picked up Stan Heiromynous’s IPA book and read it multiple times. A wealth of information, quite a bit coming from Mitch Steel, head brewer at Stone. Mitch and crew were kind enough to leave the Stone IPA recipe in the book. I’ll assume that this is the best source yet and I’ll skip trying out the various homebrew attempts as well as the apparently not accurate version included in BYO years ago. The goal here is to dial in the various aspects of the IPA recipe, mash temp, thickness, pH, hoping rates and other parameters. Instead of brewing different IPAs, I’m going to keep dialing this one in until I’ve got it exactly where I want it. Just like Stones. Besides having an impeccable IPA available in a larger batch; it means that when I do want to play around with new hops or grains, I’ve got something I know really well for comparison. Looking forward to giving this a go and sharing it with some close friends. 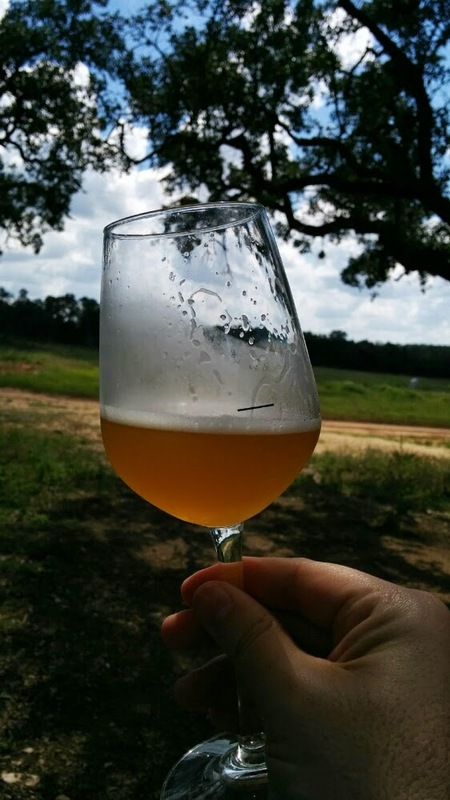 It’s that time again; cooler weather in Texas brings on the lambic-style season. I’ll be brewing a second batch of Woxbic in a few weeks. In the last post I mentioned that things would be slowing down and the rate of posting shows. Since the last post, the two batches of Saison with wild yeast fermenting at different temperatures have been bottled. It’ll be another few weeks before we have carbed bottles for tasting but the whole experience was interesting. Initially the hot fermentation produced a more sour beer, but eventually the tartness faded before bottling. The cold-side took quite a while to take off, mostly due to my lack of yeast starter. I had a huge pitch, but it wasn’t fresh. The cold side ended up much smoother in flavor profile. The hot fermentation picked up an odd flavor (not mousy, though that showed up as well). In any case, I dry-hopped both with some tasty hops and shortly we’ll have a tasting. The whole experience of brewing 11 gallons, fermenting two batches, dry-hopping, and then bottling, possibly leaving me with 4 cases of beer that may not work out seems a bit excessive given the experimental nature of the batches. This though has led me to work with smaller batches. In fact, one of the local homebrewers who has won NHC medals uses exactly this method for honing and tweaking a recipe. With that decided, I picked up a 5 gallon pot and a mini siphon and decided to have at it. 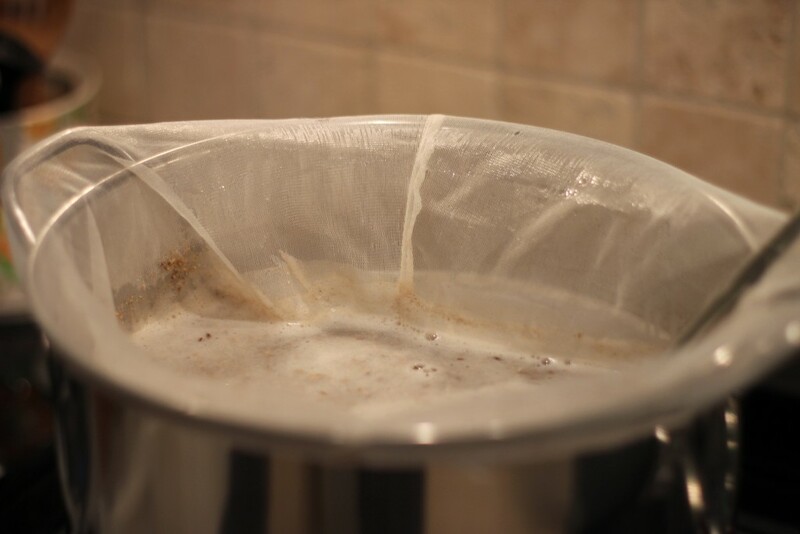 I completed a 1G recipe, Brew in a Bag (BIAB) mash to reduce the number of vessels and work with the grains I had on hand rather than purchasing Dry Malt Extract or Liquid. I had hoped that this smaller batch would mean for a shorter brew night, but it was roughly equivalent. Mostly due to the stove burner being just adequate for the 3 gallons of liquor. 20 minute strike temp, 1 hour mash, 10 minute raise to boil, 75 minute boil, 20 minute chill, plus cleanup and prep time. About 4 to 5 hours. 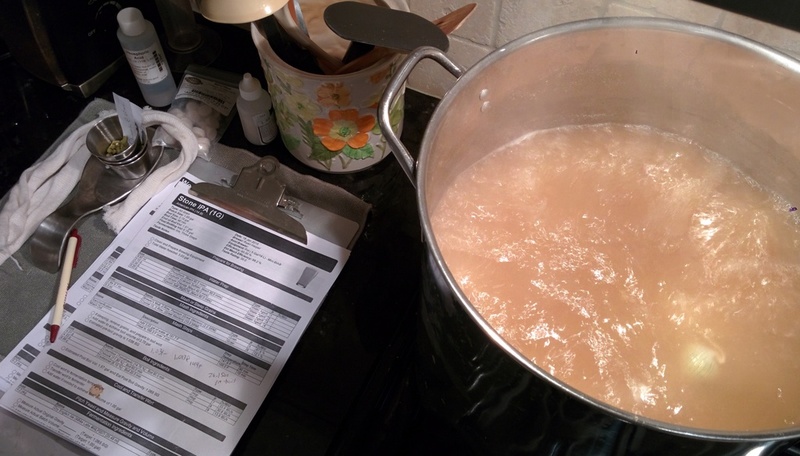 The good news was all of that brewing at a larger scale translates just fine; I didn’t forget anything and I netted about 1.5 gallons (slightly under gravity target, but I didn’t want to boil any longer for fear of raising the IBUs too high). I had recently stepped up a fresh dump of Jester King Brewery yeast picked up from Jester King itself. My friend had fermented a few beers with it and was astonished at how violent it ferments at sub 60F temps. Ill let you know how it’s going in about 4 weeks. 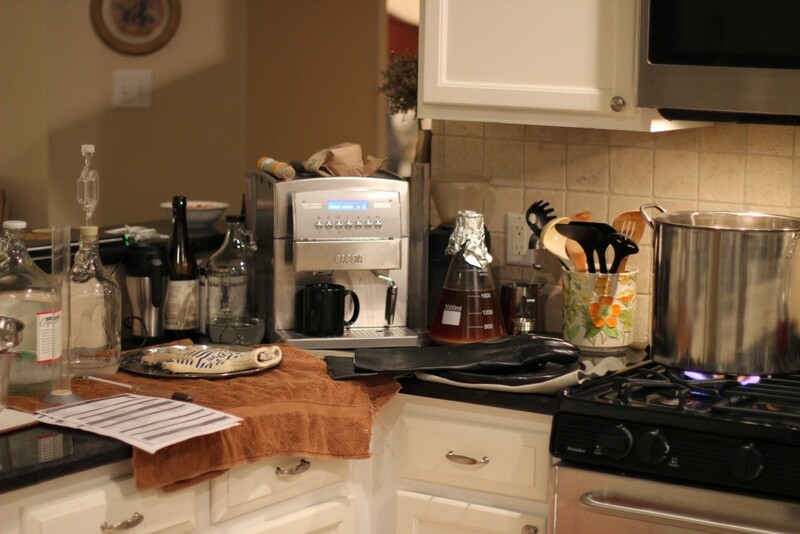 Updated: Added recipe file and notes. Mash went fine, though lost about 2 to 3 degrees with pot in the oven, preheated to 200. Dough in should have been 160, but stirred in at 157. Ended up with a 154 strike temp and ended up at 150. Boil was easy, probably took 20 minutes to get there from 150s. Held for 15 minutes with no hops to reduce water, added hops (60 minute addition), after 60 pulled hops, boiled for another 15, for total 90 minutes. O.G was low (1.068) but yield was high, 1.5G instead of 1. Can't tell if I had too much water or not. Recipe called fro 3.2 gallons, and measured by weight (8.35 lb per gallon => 26 lbs of water). Chilled in sink, accidential minor dillution. Chill time approx 20 minutes, with vigorous stirring until temp is about 117, then rested in water for another 10 minutes. Pitching temp was about 72F. Stored in 58F garage, signs of fermentation present in 12 hours. 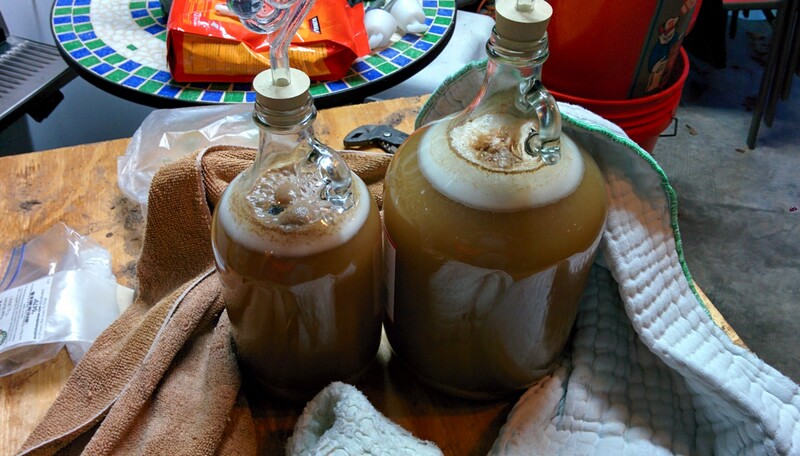 2015-01-12 full active fermentation in full swing. Ambient 55F, infrared reading of top layer of wort about 57F. 2015-01-17 -- pull 2 oz sample. Not enough for hyrometer, so utilized a refractometer. Reading was 6.8 Brix, with no correction factor, and O.G of 1.068, this puts the S.G at 1.009. pH reading shows 3.63. Lots of barnyard funk in the nose, cloudy yellow. Taste is a bit hoppy, slight tartness, some malt flavors. Obviously green beer, but not entirely bad. Drank the whole sample. 2015-01-22 -- (Pulled from .5 gallon jar vs. 1G jar) Reading 6.5 Brix with no correction, O. of 1.068, calc says S.G at 1.08. pH reading at 3.50 @ 66.6F. Nice funk, a bit flora, less cloudy. Solid sour bit, followed by some sweet pilsner flavors, a touch grainy, subtle hopiness. Tastes really good right now. Not much oak in there, yet; might add a few more cubes and see where it is in a week.